Are you afraid of crocheting garments? I have certainly avoided making them in the past, but I am willing to get my feet wet with the Pelagic Cover-Up in Interweave Crochet Summer 2018! With its simple but elegant design, this versatile cover-up is the perfect beginner garment. Simply wrap it from arm to arm to create a cute swimsuit cover-up, wrap it around your waist to create a basic skirt, or lay it flat on the sand to create a place to rest on the beach. The universally flattering, wrap dress–style Pelagic Cover-Up is the perfect addition to your summer wardrobe. It features an awesome lace pattern with a great chart for easy, repetitive stitching. Make a simple rectangle, then add an edge with chain-stitched straps: just like that, you’ve finished a gorgeous garment without even adding sleeves! The thread-weight yarn makes this vintage maritime cover-up soft and lightweight for relaxed wearing and stress-free packing. Summertime is quickly approaching, but making the Pelagic Cover-Up is quicker than you think! 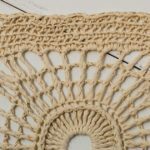 Start crocheting it now and you’ll have it done in plenty of time for your next stroll on the beach or, if you are landlocked like me, your next trip to the pool! FINISHED SIZE 28¾” tall and 51½” wide. YARN Aunt Lydia’s Crochet Thread Classic 10 (distributed by Coats and Clark) (100% mercerized cotton; 350 yd [320 m]): #0210 antique white, 6 balls. GAUGE 3 pineapples and 2 lg V-sts and 20 rows = 6″, blocked. Get started now – you won’t be able to stop!